Fiber Optic cable is a technology that uses small threads made of glass or plastic (fibers) to transmit data from one point to another. Fiber optic cabling is important to many of the everyday applications you use, such as the internet, telephone systems and cable television. Fiber optic cable is an excellent method for transmitting data and is preferable to standard copper coax cables. Why choose fiber optic cable over alternative methods? Fiber optic cable can transmit larger quantities of data with minimal loss and is able to maintain signals over long distances. Fiber Optic cabling provides the greatest information carrying capability of any medium. 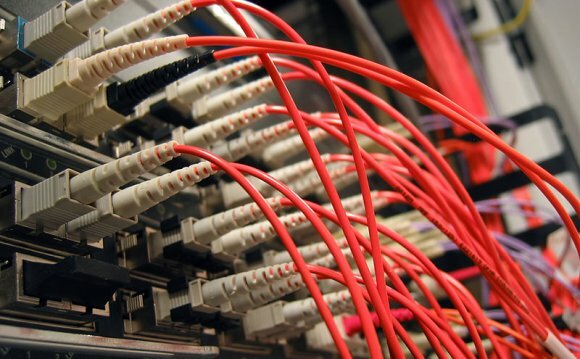 Many times when complex installation of computer networks require a span of 300 feet or more, fiber optic cabling is necessary. Fiber optic cable installation works in connecting network closets to Cat 5 networks. Other advantages are that fiber optic cable is less corrosive and is virtually free from interference. As a data transmission medium, optical fiber has a number of advantages over copper cabling. Higher bandwidth, higher speeds, longer length limitations, security, stability, little or no maintenance costs, and now the installation costs are going down. If you have the option install fiber over copper, when in doubt, choose Fiber. Is fiber optic cable installation a more complicated process than conventional copper cable? In general, fiber optic cable installation can be completed using many of the techniques used in installing copper cables. There are basic cable installation guidelines and they apply to fiber optic cable installation as well. See the infographic further down the page for a list of guidelines related to fiber optic cable installation. Who do I contact to learn if fiber optic cable installation is the right choice for me? Fiber optic cable installation should only be done by professionals or those who are familiar with installing various types of cable. DCS carries out the design, installation, testing and maintenance of Fiber Optic cabling, including Fusion Splicing & Termination of Multi-mode or Single-mode Fiber Cables. This includes both internal and external work and repair. Fiber Optic works best between buildings and is your gigabit backbone for taking your business into the future. It is faster and more reliable than copper or wireless. Delaney Computer Services has the experts it takes to complete your next fiber optic installation project. DCS handles the entire process, using various installation methods to get the job done: aerial building, building installs and underground trench installs, we are experienced in fiber optic cable installation. DCS has been a fixture in the Hudson Valley of New York, conveniently located in Rockland County. We have completed fiber optic cable installations in our area, as well as Northern NJ, Bergen County and NYC. While fiber optic cable is relatively new in its popularity, we have been offering cable installation services for over 20 Years.